Fly from Oahu to Kona for a Neighbor Island Day Trip where you’ll see recent volcanic activity and cascading waterfalls during an exciting helicopter tour. Our expert driver-guide will show you the best of the Big Island during a remarkable sightseeing tour. After you are picked up from your Waikiki-based hotel, depart at 5am for a 50 to 55-minute tour aboard a helicopter. Soar over areas, experiencing the most recent volcanic activities, and you can view the Hawaii Volcanoes National Park. On the scenic, historical and cultural land tour, you’ll enjoy live narration by your expert driver guide. The recently updated itinerary includes a visit to Royal Kona Coffee’s headquarters, Punalu‘u black sand beach, and lunch at the newly renovated Queen’s Court Restaurant in the historic Hilo Hawaiian Hotel. Enjoy views of Hilo Bay and Mauna Kea. See it all from the air and land on this exciting tour! You'll return to your original departure point by 9pm. 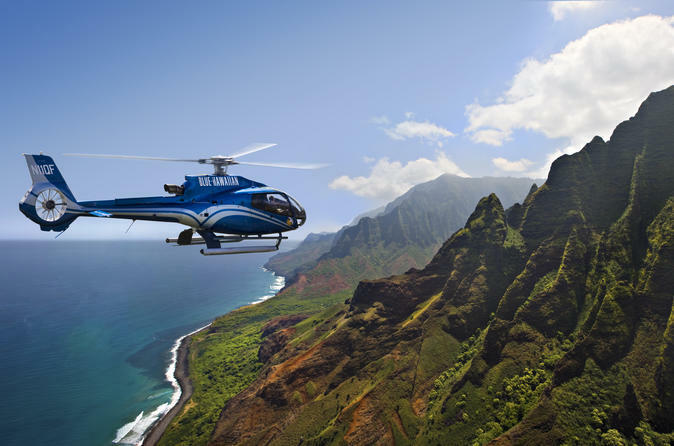 *In the event Blue Hawaiian Helicopters cancels the helicopter tour for any reason, guests will be refunded for the helicopter tour and will be welcomed on an extended sightseeing land tour. Volcanic activity changes hourly, viewing of lava is not guaranteed due to external factors outside our control.